ROOM 14 LEARNING JOURNEYS: Edublogs Challenge 2013 Is On!!! The Edublogs Challenge is run twice a year and involves schools around the world communicating through their blogs and blogging. It's an awesome way to become Global Citizens and to give and receive feedback on our learning! It runs twice a year for 10 weeks. A new challenge for the Edublogs challenge starts at March and September, each year. The Edublogs challenge for this week is about getting creative. Added tags and categoriesto all your previous posts. Added links to your blog. Checked out Earth Hour website and joined. 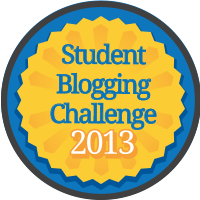 Also there are heaps more things you can do if you go on The Student Blogging Challenge! Check out the link we've copied to Google Drive from Edublogs to see who is on our list. We will give you the names of your blog buddies today.